To put storage into perspective, let’s take a typical 5MW wind turbine, the sort we see plastered across the countryside. Tesla’s South Australian storage system can provide, as we have seen, 129 MWh. So we would need five of these, at a cost of £400m. It may be that to need such large reserves of power would be a rare event, a reliable grid needs to cater for all contingencies. Meanwhile, Claire Perry whittles on about smart grids and storage, and a gullible public falls for it. “100MW sounds impressive, but as his own specifications made clear the maximum output was only 129 MWh.” There’s a confusion of units there. California specifies a battery storage capacity in megawatts. No kidding. I would prefer gallons. Or between power and energy. I have been examining what energy ministers have been saying from Ed Miliband through to Claire Perry and I am certain that not one of them knows the difference between power and energy. It’s no wonder the country is in a mess when we’ve had all these PPEs etc in charge. In Jillian Ambrose’s piece here (now behind a paywall) she goes the whole article quoting MW, not once MWh. You really do feel like throttling some of these people….. How DO YOU get the message across about the King’s new clothes? Taken to its inevitable outcome – next they will be saying you don’t really want a reliable grid and never really had one anyway. Except of course Zibelman is working away from having a reliable grid. She wants lots of renewables, and closing down dispatchable coal stations. Indeed, it’s precisely because the closed down the Hazlewood coal fired station not so long back that Victoria ran into problems with inadequate supply and rolling power cuts. The Zibelman plan cost Australians an extra A$1bn over just two days of hot weather. I’ve long said, nothing will help our energy supply system become more robust until we remove the pollution … from our knowledge base. Well, it seems that the intended purpose of wind and solar power is to accordingly reduce the use of fossil fuel power generation. It also seems that the current state of the art of battery storage is “too” expensive, with the “hope” that they will become reasonably expensive in some unknown distant/near future. And an interesting question is what is more “expensive”: to maximize generation, and storage, of wind and solar power, or to pay for the continuing use of fossil fuel and nuclear power and their collateral damage to the environment and all living creatures on earth? Ben, you do understand that if you’re using wind power to charge batteries you can’t use that power for utility use. It’s going to be one or the other. In other words, it’s only worth charging batteries – if it is at all a good strategy (not, IMO) – if you have an excess of power being generated, but, if you have an excess you don’t need wind turbines in the first place. Another crucially important aspect of windmill engineering that the Mr Truths need to understand (but don’t) is that because they only produce any usable power in a relatively narrow windspeed range BUT, even then the actual power output can vary hugely with changing windspeeds, they will always be a very expensive form of power because they need reliable, dispatchable power sources as cover, almost all of the time. To elucidate on the speeds, if you chart output v wind speed of the average windmill, not a great deal of power is produced before 10 miles per hour, output then rises very rapidly to about 25mph before levelling out at about 30mph. If wind speeds continue to rise above about 30mph, you continue to get good output at the same rate until, calamity!, the windmills have to be shut down at around 55mph for operational and safety reasons. However, it gets worse. The nature of a nation-wide electricity grid is that it needs stable, predictable power for such trivial things as houses, schools, hospitals, the internet, telecommunications, factories and, yes, even railways. That wonderful, 10mph to 30mph zone mentioned above, however, is notable because its power output gradient is very steep, so regional winds fluctuating up or down even by as much as 5mph cause significant changes in windmill array power output which, in turn, causes all sorts of grid management problems. Having, for instance, nuclear or CCGT power stations as back-up is not only very expensive but you simply cannot just turn them on or off at the speed at which weather systems develop. In short, windmills may well have good uses, perhaps for specific cases where power output does not have to be stable. For country-wide electricity grids, however, until and unless we get economic, scaleable, long-lasting battery arrays using a revolution in battery technology clearly not even remotely close now, windmill arrays are simply not fit-for-purpose for powering a national electricity grid. Indeed, whether the requirement is for as yet un-invented battery arrays, or constant back-up from dispatchable power stations the reality of wind forming a material part of our national grid simply must mean very, and unnecessarily, expensive electricity. Another thing these battery storage enthusiasts forget is that the batteries need charging after use. And guess where the electricity will come from? If it’s from the wind farm, then there won’t be any spare to use for actual consumption, so the net effect is nearly zero, and that’s after ignoring the losses incurred in charging and discharging. Overall, the average power into the batteries is a bit more than the average power which can be extracted. So what’s the point of having them at all? What’s the point of storing potatoes in autumn to eat them later? Just try to imagine a battery that will collect enough summer sunshine in Ireland to keep you warm in the winter. It makes going out to the bogs, cutting “turf”, and stacking it in the rain in Donegal to dry look quite a practical way to feed your fires. Except, arfur, you would expect your expensively charged-up EV actually to work most of the time, even if it’s only for a while. For reasons outlined in my comment above, windmills don’t work most of the time, are totally unpredictable and if they get too excited, you have to turn them off! EVs are, in many ways, easier to understand than windmills, although both are just as stupid in the wider context of a developed country’s more significant energy sources and uses. That is what our sad little authoress planned for with her electric car and her cell phone full of apps to find charging stations as she traversed mountainous terrain. She had to call someone to tow her instead if having the tow truck follow her. Sad story. For the benefit of those not from Oz, only 4 Days ago when South Australia had its latest blackout, the fabulous Tesla mega-battery managed just 3 hours output at 30MW — a drop in the bucket. It then began recharging itself at the peak of the power shortage because it has contractual obligations to maintain frequency or some such. What a bloody joke. Its main function is not to support the grid, but to game the system for its owners by buying low and selling high. You can download the 5 minute data from the csv link. It discharged at 29.6MW from 15:30 to 18:30 on the 24th, exhausting the charge it had taken on between 1 a.m. and 4 a.m. It did make over A$1m over the two days. Something is wrong with these numbers. The battery can only supply peak load for 5 minutes. It is physically incapable of providing 30 MW for 3 hours! How so? Unless my maths is wrong, 5 mins X 30MW = only 2.5 MWh from a 129MWh battery. How is it physically incapable of exceeding that? Regardless, the Nemlog record in the link above shows the 3 hour block of constant discharge at a shade under 30MW, then re-charging in bursts from 8pm. The battery when built was theoretically able to single-handedly power all of South Australia for about 4 minutes at average demand if it could discharge that quickly without self-destructing and discharge right down to zero (which it can’t). Is that the source of confusion in your 5 minute comment? […] because it has contractual obligations to maintain frequency or some such. The overall load on the grid dictates the frequency and, in an ideal world, the output of all reliable sources. The other problem that the activists don’t talk about is that batteries only last about 8 years. It’s very difficult to increase the lifetime of batteries because of the chemistry and their complexity. What is the source of the energy necessary to produce said replacement batteries? A donkey in a wheel? Around here, we call it coal. That’s the battery, not the storage availability into the grid for when the wind doesn’t blow. While total battery power is 100MW, energy flows are capped at 30MW, with the remaining 70MW held in reserve to provide frequency control services for the highly intermittent wind sources, contributing to the security of the grid. However, it *is* very good / excellent at providing those frequency control services. Meant not the *power* availability into the grid for when the wind doesn’t blow. The 70MW is supposedly under the control of the SA government – but it doesn’t last long as they only have 30MWh or so of storage for it. Maybe just enough time to fire up the diesel gensets they procured expensively (and were forced to use at full capacity). The rest of the battery is for FCAS and price arbitrage. They seem to be allowed to recharge at up to 40MW. Round trip losses are of the order of 20%. It may not be much use as a fix for the intermittency of wind power, but it is great as a propaganda device to the intermittent wind industry! I worked it out at £632 billions-worth of Powerpack 2 to ‘drag’ low-wind cfs up to the annual average, for a not over-significant 13 day period last year. It would have taken 7,541,350 Powerpack 2s and they would have occupied 2.85 km x 2.85 km. I couldn’t bring myself to even think about the waste issue! Now serious storage is a different matter altogether. I calculate that if the UK were to go for a 100% wind/solar grid, we would need storage of the order of 35TWh, most of which would only be drawn on in a really bad year for renewables generation, but a chunk of which would be needed just annually to cover seasonal variations. The cost, even as pumped storage, would be horrendous – and where do you put 3,900 Dinorwigs at £425m each in 1980s money anyway? Beef up demand for electric heating (a real seasonal shocker) and electrified transport, and the sums get truly horrendous. IDAU: I know it’s only a whimsical calculation but does that 35TWh needed to create the energy stored in the batteries come from existing windfarms or have you calculated fr the number of extra turbines needed to create it? A 100% solar/wind grid would need to be capable of supporting (a significant proportion) the country’s power needs PLUS the needs of the batteries being charged for when they are needed. I assumed 75% round trip efficiency by crediting the store with only 75% of surplus generation, using 30 years of hourly wind and solar data from Staffel and Pfenniger which is supposedly derived from weather and satellite data reanalysed and calibrated with actual outputs in more recent times, and required that the whole balance over the 30 years with demand being met.The store has to be capable of redelivering over 90% of peak demand, and of absorbing a summer solar peak. The wind to solar ratio was adjusted to minimise storage required. Uhuh, I’m listening ….. and IF it worked, and others were to follow…. What then? sufficient resources in world to supply? etc etc. I instruct my students: BEFORE you start a process, How Do you STOP it ? Politicians and the MSM should think about that BEFORE they spit out so much junk. Beef up demand for electric heating (a real seasonal shocker) and electrified transport, and the sums get truly horrendous. And the use of masses of rare earth materials to start with. Dr North once said that he used to respect people in prestigious positions such as politicians. Then when he started meeting some of them he was left wondering how they got through the day, such was their ignorance and stupidity. I’m not sure it’s the gullible public falling for it, I think it is mostly the press who will not admit the facts and tell the public what is going on. They are probably afraid of the Bob Ward Stasi. The other fact is though, would any company or industry buy a piece of kit that is only 28% efficient? I think the answer is No., Would any motorist buy a car that only achieves a performance level of 28% of what the manufacturer claims. Again the answer must be No. And yet our stupid Government seems to think to use and expand on using an energy generating process that is only 28% efficient is the way forward. God, forbid when are we going to get rid of these idiots? or heat for your home in an open fire. The issue with wind turbines/solar is their intermittenty , which means their electricity in incomparable with electricity that is reliable. 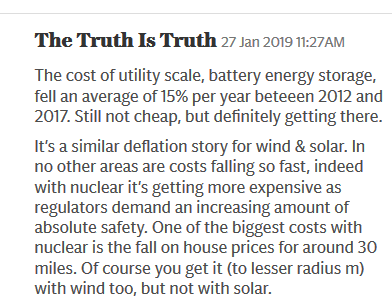 Keith, you are correct about the public, just look at the majority of comments on any Wind/Solar/Battery article in the MSM. They are negative with agreat deal of knowledgable people giving facts and even quoting Paul on occassions. Is that the same sort of ‘truth’ the Telegraph were printing about the First Lady? The BBC radio five science programme (aka Thought For The Day from the new Planet Saving religion) gave an (almost) unrestricted platform to Prof Stuart Haszeldine, who has now apparently overcome the slight problem of being a professor of something that doesn’t exist (Carbon Capture and Storage). The BBC presenter mentioned at the end that the cost would be “several times” higher than electricity from conventional sources, the poor guy has probably been handed his P45 and outed as a denier on social media. Prof Hazeldine was interviewed with Piers Corbyn on LBC 9th October,Corbyn stated that no scientific paper exists that proves CO2 drives global temperatures. Hazeldine gave Venus as proof, composed mainly of CO2 being much hotter than earth . Of course Venus has a “heavy” atmosphere and is much closer to the sun. There you go. And of course all these batteries will need to be stored in air conditioned rooms to keep them in top condition. Interested to see what everyone thinks of the development of liquid metal batteries? Hopefully a quantum leap better that the existing batteries. Although it doesn’t solve the discharge/re-charge issue apart from some old fashioned over engineering. If it “works,” it will be implemented somewhere, and we can then evaluate its true usefulness. The basic science is not new. But new technology, most emphatically, does not have to use new science. Personally, I have been aware of him for about ten years – ever since I watched the MIT video lectures of his freshman course on materials and electro-chemistry. Can’t say I took to the man, although I found the lectures interesting, and recommend them. I think it would be worth making the mines safe to open. I gather it’s a Yorkshire saying! I think that these things are doing a magnificent job, if you own fossil carbon interests, of casting discredit upon the proposition that it’s time you were replaced. Far too many of my fellow environmentalists are too ignorant or stupid stupid to see, as Michael Shellenberger, James Hansen, and Alex Cannara know that civilian nuclear is the only solution. It’s the arithmetic, stupid! Look at the depths of the troughs in any record of wind power production, and how many days it lasts. Pumped hydro storage, at Bath County in Virginia, is the biggest AC electricity storage in the world. Look it up if you like. There is no battery imaginable with output capacity of that facility’s 3030 MW, and its storage capacity is 24,000 MWh. If you compare that with what’s needed for the troughs in a flourishing wind or solar location, you can be sure storage will ever be enough. THEREFORE, it is Impossible to fight Global Oceanic Warming and Acidification, with ANYthing other than Civilian Nuclear. Note that, as the Thorcon Power company website says, this is needed World Wide. In 1962, a major high pressure area sat across the UK. In broad terms,”snow* started falling on Boxing day 1962and started melting ate Easter – March 1963″. There was barely a whiff of wind across most of the British Isles, and temperatures were consistently lower than I can ever remember. Across that period there was absolutely NO wind, and would have been very little solar electricity. Mr Musk’s batteries might have lasted a few hour – if there were lots of the – but, three months? Renewable energy fanatics dream on..
* I walked to school with 8ft snowdrifts along the side of the road. They didn’t melt, just stayed there for the whole period. As I once wrote here: after a foot of fresh snow had fallen, I walked along the frozen River Cam, at night in early 1963, between the Colleges, which were softly lit up. It was beautiful. One does not feel the cold at that age. There was a lot of cloud cover during this period, but the ground-directed radiation from this ‘blanket’ could only slow, and not stop, the overall temperature from dropping. As a physicist, I understood this perfectly well. When the lawns finally emerged, the grass was in a terrible state – because lazy undergraduates had peed in the snow there, instead of making a chilly trip to the bath-house. I almost hope that – after the coal stations have been demolished – another winter like that of 1962/3 or 1947/8 comes to the UK. I will be in the Med, laughing my head off!